A trio of cello players who call themselves the Extreme Cellists have taken inspiration from the weird sport of Extreme Ironing to create their own weird sport. It’s called, naturally, Extreme Cello. 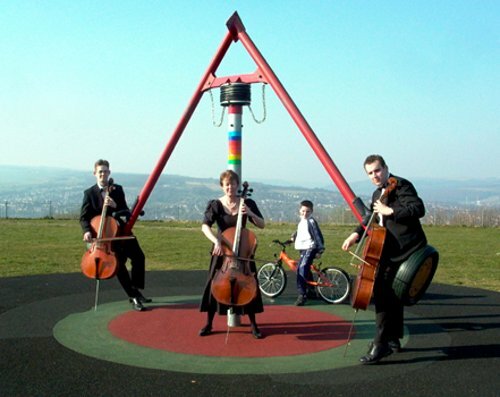 The Extreme Cellists like to play their instruments in unusual locations (usually outdoors). The performance group likes to raise money for charities, for example Aspire, a charity related to spinal injuries. Extreme Cello Cathedral Roof Tour. Playing cellos on the rooftops of 42 English Cathedrals. Extreme Cello Four Peaks Challenge. They played at the summits of the tallest mountains in Ireland, Scotland, England, and Wales. 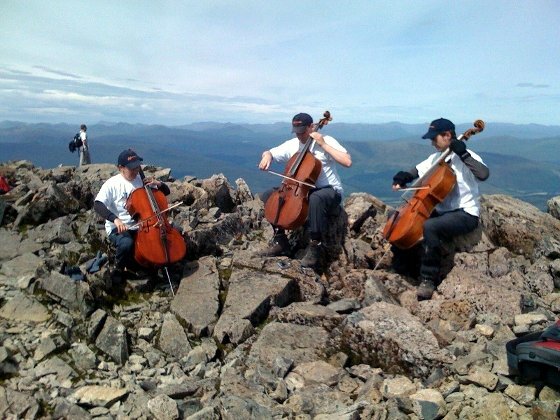 Here are the Extreme Cellists playing at the summit of Ben Nevis (Four Peaks Challenge, July 2008). Ben Nevis, also called “The Ben”, is a mountain located in the Scottish Highlands, and is the highest mountain in the British Isles at 4,409 feet.